If you're a fan of detailed toys based on iconic horror movie characters, it's your lucky day. Todd McFarlane has revealed that Movie Maniacs, Tortured Souls and more high-end collectible toy lines are coming back. 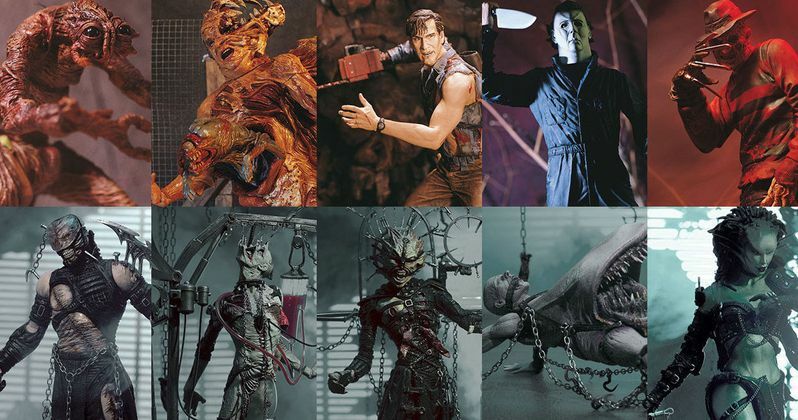 McFarlane Toys launched these boutique horror brands starting in the late 90s and into the early 2000s. Unfortunately, at one point, they just stopped making business sense and went by the wayside. Luckily, things have changed and they're coming back. Todd McFarlane made the reveal during an interview at New York Comic Con over the weekend. The man who created Spawn and shepherded Spider-Man during the 90s explained that there used to be a lot of middlemen, red tape and other hurdles in the way that made these toy lines far more difficult to produce for several years. Here's what he had to say about it. "We live in a brave new world now where you can go literally from production to the consumer, right? You can cut out all the middle men and we're seeing that with Kickstarters and people doing direct, you know, dot com. So what we're gonna do is, when we started McFarlane Toys twenty-plus years ago, we were built on the detailed stuff, doing all these cool monsters and all this sort of wicked stuff. Unfortunately, the stores we were selling to at that point, like Tower Records and Suncoast and Babbage's and KB Toys, and all these other ones, they've all fallen to the wayside. So we end up having to follow the game plan of the Fortune 500 companies and having to do big brands. But we're gonna just start selling more just direct to the consumer." While many of us may have nostalgic, warm feelings when thinking of Suncoast or Tower Records, those shops are long gone. And so with them their shelf space for collectibles and toys such as Horror Maniacs, a line that brought incredible figurine versions of characters like Freddy Krueger, Leatherface, Jason and more to life, or Tortured Souls, which came from the mind of horror legend Clive Barker. But now, McFarlane Toys can just offer them right up to the fans who want them, with no middleman. Mcfarlane went on to elaborate on the company's specific plans. "So we're gonna go back to our origins and we're gonna go, hey, for all you people who like Tortured Souls? There's gonna be more. For all you people who like some of the Movie Maniacs? There's gonna be more. But even the new, the stuff we just created, like Dragons? More. Spawn? More. Twisted Tales? More. All the crazy stuff that we used to sell that we can't because people just want brands now, the stores, I go so don't worry about it. We'll just sell it directly to you, the consumer. So that's gonna be a big push for us." Companys like NECA and certainly Funko have come along to give collectors somewhere to go for these sorts of things. But McFarlane Toys does great work and seeing these lines come back should be welcome news for collectors. Hopefully, Todd McFarlane can get this up and running before he's neck-deep in production on the new Spawn movie. This news was originally reported by IGN.